Do you feel Nourished by Connection? 1) Social media. A recent Facebook post got more “likes” and responses than I’ve ever had. Though this wave of support and excitement was over-whelming, it also prompted an ego-check for me personally. Though I use social media for marketing and promo for my wild business, have I also begun to seek self-validation? Do I post a selfie on days when I’m feeling down or lacking in self-confidence? Social media is a powerful tool for marketing and connecting in wild business, BUT precaution is necessary. Does this kind of connection truly nourish and fulfill us? Furthermore, are there other ways of marketing our wild businesses that may be more deep, stable and long-lasting…? 2) Jungle guests unplug. The Tailwind Jungle Lodge was recently filled with young Mexican professionals from the nearby city of Guadalajara. When I gave one couple the wifi password, they waived it off and said, “We came to the jungle unplug, to reconnect with the natural world.” YES!!! May the jungle work its magic! Wildpreneurs know this well, but unplugging and reconnecting with our natural roots is key for our wellness equation. 3) Hospital visit. A minor health incident landed me in the emergency room at the San Pancho hospital. I was over-whelmed by the care and compassion I received from all the staff (working on a Sunday). Several nurses and a young Mexican doctor listened attentively as I explained my predicament. They made several recommendations for healing and said that there would be no charge. Wow, thank you small town living. I walked away feeling connected, loved and grateful. 4) HIIT the beach workout. I always look forward to my morning beach workouts with Shanti Tilling. It's not only a time to move, sweat, play and challenge my body, it’s also a place to connect with my local friends without exchanging many words. 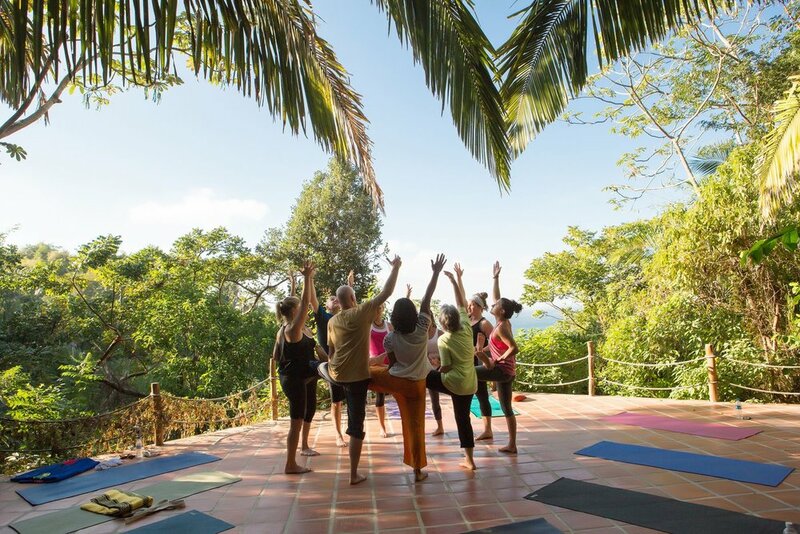 The shared energetic vibration of these classes is a truly nourishing kind of connection. How do you connect without words? 5) Internet outage. Wifi went down in the jungle for the week (satellite system temporary malfunction) and very slow internet in the town of San Pancho. The result? Much less iphone checking, more presence and meaningful conversations. Though it was a challenge to get work done (my online to-do list grew very long) the technology detox was actually AWESOME. Maybe in order to feel connected, I should disconnect more often…! Take a moment to reflect on your connections this week. What fulfilled you? What didn’t? Bonus: Check out the documentary: La Era De Desconexcion, screened at the Sayulita film festival Feb. 2019. This documentary takes a look at the affects of the growing seperation of humans from the natural world. As we drift towards city lifestyle, we forget our natural roots and become more prone to addiction; from drugs and alcohol to social media and workaholic (numbing mechanisms). This documentary is the story of 10 individuals who where disengaged and suffocated by self-destructive habits, and healed themselves by restoring their connection to the natural world.